Handheld technology gives autistic students a learning boost -- and a social one. Lynn Parsons, a special education teacher who runs an after-school social-skills program at Birdville High School, outside of Fort Worth, Texas, gives half of her dozen autistic students a Palm T|X to use throughout the year. One of the many things they do with this handheld device is take pictures of their pets, which they later share with classmates. "It enables them to initiate more social interactions than they would otherwise," Parsons says. But the mother of one autistic student, noting the handheld's audio features, wanted the Palm T|X to literally speak to her son, a freshman who'd found shuttling between classes and teachers in a new building overwhelming. Parsons, who knew that the boy's younger brother enjoyed making videos, suggested an alternative: Have the younger boy film and narrate a walk-through of his older sibling's typical day. It worked. The freshman watched the video repeatedly, thus becoming comfortable with the new routine, and returned to school. "His mother told me, 'You're a genius,'" Parsons recalls. "I said, 'I'm not a genius. This is just a video camera.'" In special education parlance, assistive technology, or AT, is any piece of equipment used to improve a student's functional capabilities; it could be as simple as a pencil with a rubber grip or as sophisticated as a computer enhanced for use by a quadriplegic. (See the Edutopia article, "Assistive Technology: Enhanced Learning for All.") According to Parsons, whatever the tool, it has to be usefully integrated in a way that suits a student's needs. In fact, many AT practitioners believe that the diagnostic label a special-needs student has is far less significant than the specific challenges he or she faces, which along the autism spectrum range in type and degree. "The idea for all technology is to augment, to build on the knowledge and skills that students bring to each task," explains Joy Zabala, a renowned AT specialist working with the Massachusetts-based Center for Applied Special Technology. She points out that the biggest challenges for autistic students relate to "communication, socialization, and task completion." Well-resourced public schools address all three these challenges in common ways with high tech AT. Voice-recognition software and assistive-writing devices, for example, help those with language or fine-motor deficits. Audio-text software and graphic organizers not only highlight sections of text, thus accommodating focused reading, they also help students write down notes and question prompts, which aids in organization and comprehension. "These kinds of software that help students pay attention and do their work are huge," observes Jeanne Dwyer, program coordinator for the Johns Hopkins University Center for Technology in Education. 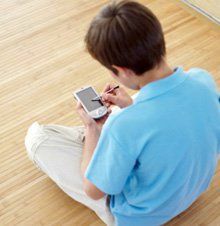 But if the aim is eventually to go beyond the curriculum to help autistic students become self-sufficient adults, then the use of handheld devices may become key. "AT has to be handheld, portable, and intuitive for student to use," Dwyer says. This idea has already taken hold at Birdville High School, part of a tech-friendly district in which all teachers get training in computer basics. Those who take extra classes receive Palm devices, so it shouldn't be a surprise that when Parsons took over the social-skills program six years ago, handhelds were already in circulation among high-functioning autistic students. Early on, the students used the "primitive" Palm m515 mostly for organization. Parsons notes that most autistic students have a structured mind-set: "You do schoolwork at school, not at home." The Palm enabled them to keep track of assignments in both locations, with alarm settings serving as reminders. A couple of years later, an upgrade in equipment to the Palm T|X brought with it a color palette (good for the visually oriented, as autistic students often are) as well as picture taking and audio and video features. Soon, it became a socialization tool. Students, for example, who'd never bothered to learn teachers' or classmates' names could now take photos and attach names to faces for memorization purposes. Students also program social cues into the Palms -- everything from what to say to classmates during lunch ("How's your day going?") to proper etiquette at funerals, a place where "everything's different socially from anything they've done before," Parsons states. Part of what is appealing about all handhelds -- Palms, BlackBerrys, mp3 players -- is the social cachet they bring with them. "As they take the handheld out and use it in class, other students ask them about it," Parsons says, "so they're considered cool for the first time in their lives." The Palm also offers a means of expression. Because it's something of a personal repository -- for lists, photos, favorite songs -- the logical next step, when it's connected to a keyboard, is to pour one's thoughts into the device. "Kids I could barely get to write a couple of sentences will write a couple of pages," Parsons reports. One student even wrote a novel. Parsons, who has a master's degree in integrating technology, doesn't limit AT to handheld devices. She's also used videos to teach social skills and says PowerPoint is a favorite among autistic students; they've used it in slide shows on interpreting facial expressions. Geocaching, the treasure-finding game that involves the use of a global-positioning system (GPS) device, is another big hit that not only demands collaboration but also requires following directions, which is a challenge for these kids, Parsons notes. Parsons's work is representative of what Joy Zabala believes all educators should do with assistive technology -- lower barriers. She cautions, however, that no matter what the tool is, it should be something educators, parents, and students find useful. "Is the technology you're using leading toward the goal you have, or is it just cool?" she asks. Rich Shea is a freelance writer in Maryland.